Glacier Glove's Guide Glove is a pro favorite. 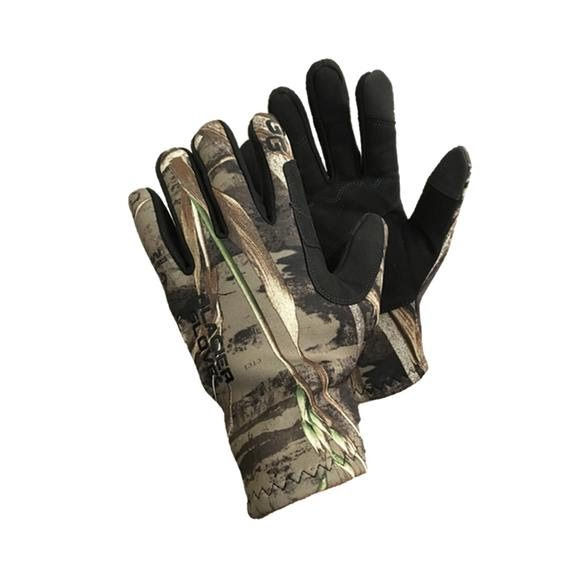 Great for any outdoor activity, this glove is both durable and versatile and features Advantage MAX 5 HD camouflage pattern for waterfowlers. Glacier Glove &apos;s Guide Glove is a pro favorite. Great for any outdoor activity, this glove is both durable and versatile and features Advantage MAX 5 HD camouflage pattern for waterfowlers. Built with waterfowlers in mind, new Realtree MAX-5 is filled with cattails, reeds, cane and grasses to blend into flooded marshes. Plus corn, wheat, oats and sunflowers to hide you in open fields. It has branches, twigs and leaves that work in flooded timber. And with open areas that mimic mud, water, bark and shadows, MAX-5 literally adds another layer of invisibility to camo, no matter where or how you use it. Of course, all MAX-5 pattern elements are strategically placed to create super-realistic tone, contrast and shadow. Viewed up close, MAX-5 offers incredible detail. At a distance, the pattern obliterates the human outline completely. The result?